This fundraiser honored the 287 birthday of our founding father, George Washington. This year also celebrated Franco-American friendship and the special relationship between Washington and Lafayette. This successful event featured a seated dinner by one of the D.C. metropolitan area’s premier caterers, Design Cuisine, live music and dancing, and a special cake cutting ceremony with General Washington and the Marquis de Lafayette. Proceeds for the event will go toward the Neighborhood Friends of Mount Vernon’s 2019 annual project that supports the West Front Exterior Mansion Restoration. 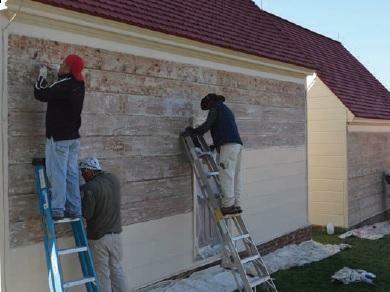 To keep the Mansion’s siding—much of which is original to Washington’s time—weathertight, and to ensure that it protects the building for years to come, it is imperative that we strip off the paint, make repairs, and then apply a fresh coat of paint and sand.